It was clear from the outset that the elements would have a major part to play in the outcome of this game. The pitch was heavy and wet, frequent flurries of snow descended and a strong wind just added to the fun. An exciting first half saw us take the lead twice before the second period when we rarely crossed the halfway line. The loss of the late penalty was a cruel blow but overall we can be satisfied with a point. Law returned to the right back position as Kennedy made room and Lasley kicked off facing the 260 'Well fans behind the goal. It was soon revealed that there were patches of the pitch that killed the bounce while in others the ball skidded off the surface. It was a nightmare for defenders. After four minutes Cadden opened the scoring with a well taken strike. He collected the ball on his chest and fired into the top left corner from 15 yards. When McGowan popped up at the other end three minutes later to equalise most of the crowd anticipated a high scoring match and chances kept coming. A Lasley free kick almost deceived Bain as the ball arrowed to his left post and moments later Loy struck the bar from close range when a goal looked likely. McDonald found the ball at his feet in what looked like an offside position but the flag stayed down and the resultant 10 yard shot was saved. The game was flowing from end to end and we scored a well constructed second when Pearson and Moult executed a one-two at the edge of the box to allow our midfielder to run in on goal a place the ball beyond the 'keeper. Moult came close to extending the lead when his curled effort came close. The second half was a one sided affair. Dundee camped in our final third for long spells and there were few breaks to relieve the pressure. Our defence fought hard and gave the opposition very few scoring chances. We had one excellent opportunity when McDonald started a run from well inside our half. He made ground and released Pearson on the left. He charged into the box and his shot waqs knocked home by Moult by the stand side assistant raised his flag to cut our celebrations short. We were inside the last five minutes when referee Beaton made a decision he will surely regret when he sees video of the incident. Cadden, close to the edge of the box, cleared a ball but was penalised, presumably for dangerous play. In his post match interview Mark McGhee was adamant that it should not have been a penalty but the award cot us a couple of points as Hemmings made no mistake from the spot. 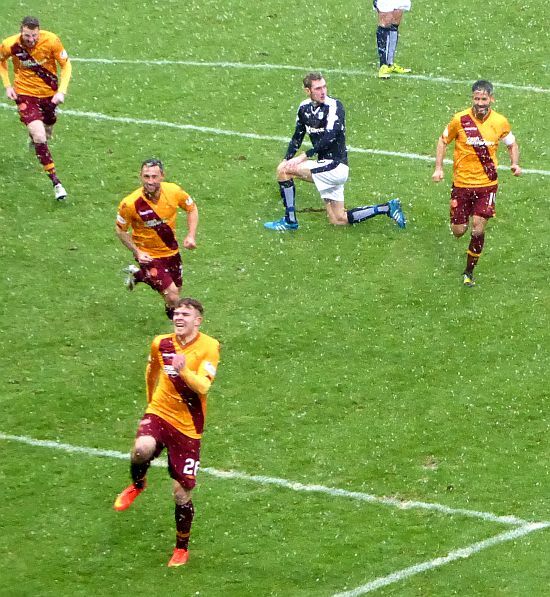 A point on the road is rarely a bad result and we look forward to Tuesday's trip to Firhill.